A city of almost 12,000 about 2.25 hours southeast of Buffalo. summer. Farther out, there are inviting campgrounds, Chemung River birding, canoeing and kayaking, and myriad breweries. Quinoa, cabbage and Thai peanut sauce crepe at Poppleton Bakery. Poppleton Bakery and Cafe, 23 W. Market St. You can’t beat the variety here. I enjoyed the quinoa, cabbage and Thai peanut sauce crepe. So good! Plus Friday is macaron day. Sorge’s, 68 W. Market St. Selecting a dinner spot was seriously difficult. Hand + Foot (named for the card game) and top-rated Tony R’s (steakhouse) were contenders, but I opted for Sorge’s, a family-owned restaurant since 1951. The service was excellent, and I enjoyed not only the Sorge burger, made from their pork and beef meatball recipe, but also the easy camaraderie among patrons and staff. The Gaffer Inn, 60 West Market St. These well-appointed rooms above Burgers & Beers are in the middle of downtown. Just step outside and enjoy yourself. Radisson, 125 Denison Parkway East. 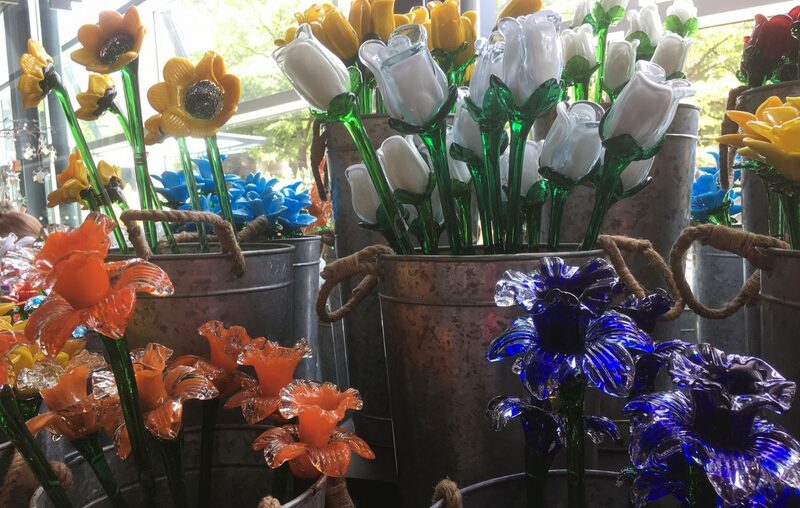 Situated at one end of Market Street, it’s a convenient starting point for a couple days spent walking around town, touring the glass museum and even driving into nearby Watkins Glen or to Seneca Lake wineries. The Corning Museum of Glass is a big draw for the area, with beautiful exhibits and hands-on glassmaking workshops. Corning Museum of Glass, 1 Museum Way. You can spend an hour or two, or most of a day, looking at exhibits of glass throughout history, attending demonstrations or educational sessions, or browsing in the massive shop that sells everything from a $16 Ruth Bader Ginsburg coaster to an $825 green dinosaur. I’d decided to make a glass pendant, so I reserved a 2 p.m. slot and was assigned a guide. She helped me pick colors (purple, blue and white) and explained how to safely hold a thin stick of glass in the flame and turn it just so to melt and shape it before pressing it flat. Rockwell Museum, 111 Cedar St. Housed in a gorgeous red-brick building, the museum focuses on paintings and sculptures depicting the American migration west. When planning a visit, check its schedule to take advantage of one of many family-friendly events. 171 Cedar Arts Center, 171 and 155 Cedar St. Tourists usually don’t think to visit here, but it’s worth checking out the rotating exhibitions and live performances. Pure Design sells a fun selection of gift items. Card Carrying Books & Gifts, 15 E. Market St. This small feminist bookstore that opened last year is already a destination for people looking for a sense of community, said co-owner Sarah Blagg, drawing people from Buffalo and Pennsylvania. Pure Design, 39 E. Market St. The beauty of this place is that you never know what you’ll find, but you know that it’s been carefully chosen. I have a rule that if a greeting card makes me laugh out loud, I buy it. I walked out with four, plus a hammered aluminum necklace and thoughts of returning for an umbrella that changes colors.